The F3000 pack is particularly suited to fashion / clothing outlets, shoe shops, jewellery shops, gift shops and similar types of business. It is a popular Windows-based EPOS System that is easy to use, easy to setup and very reliable in operation. It provides comprehensive point-of-sale features for fast and easy processing of sales transactions, with built-in stock control, supplier ordering, special orders and a wide range of sales, accounting and stock reports. Sales features include discount functions, a Customer Database with credit limit settings and mailing list. You can scan barcodes of the manufacturer or using the optional Label Printer you can generate and print your own barcode labels quickly and easily. Whether you run a single premises, a chain of stores or a wholesale / trade counter, the F3000 Fashion EPoS package is loaded with many retail features to support your business. The software has a unique "Style Matrix" which makes it perfect for clothing stores. With the Style Matrix, you dont need to create lots pf individual product records for every colour/size combination. You simply define the main Style and then list the available Sizes and Colours within that style. The system is flexible so you can adopt uniform pricing for all sizes/colours of the style, or you can have different buying/selling prices for different sizes/colours within the same Style. The standard package includes the latest, high performance Titan S265V Windows-based touchscreen terminal with its modern slimline design, stylish high gloss finish and fast response time. An optional rear 2-line customer display screen is available. 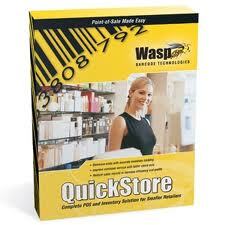 Wireless barcode scanners, barcode label printers and hand held stock-taking terminals can be optionally added. The system can also print A4 size invoices and statements in addition to mini receipts by adding a desktop printer to the package. The optional upgrade to the Professional Edition provides many additional management and accounting reports. The Enterprise Edition allows multiple branches to communicate to a head office for centralised reporting and database maintenance, giving you total control of your retail / wholesale business. Optional VFD Customer Display available. The Service Pack includes initial set up of the system with your business details and menu/products, a 2 hour remote training session and a Level One Support Subscription. On-Site Setup & Training at your premises, installation, network cabling and enhanced Support Subscriptions are available - please ask for a quote.ly. 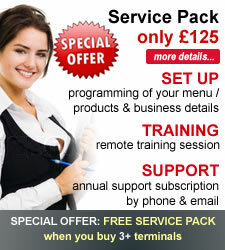 Technical support is included FREE for the first year provided you book remote or training. It is available during office hours Monday to Friday by UK-based staff. Enhanced support subscriptions are available - please ask for a quote. Friday 19-April-2019 23:48 Our office is currently closed. We will be open again from 10am tomorrow.